Well, it was a week before Memorial Day Weekend when we went to REI to buy ourselves some freeze-dried food for our mid-June backpacking trip. But we over-shopped a bit, and ended up buying a new tent. Did we really need a new tent? No. Our old one was fine. But it wasn’t great. You had to duck down extra low to get your hips under the doorway, and opening the door on the tarp from the inside required major stretching to reach the distant zipper when closed. Also, the plastic zippers were beginning to get tired, and would occasionally de-zip themselves when closing them too fast; you had to hold the zipper-head at a precise angle and not zip too fast in order to close the doors. It was this last deficiency that tipped the scales, as we had already laid our plans for a spring and summer full of backpacking adventure. Letting in a bunch of bugs and/or losing our watertight integrity when far from civilization was a definite no-no. Vicki thought about re-installing new metal zippers, as she’s an excellent seamstress, but long zippers are expensive, and doing all the work takes time. When we got to REI we discovered that they were having a special sale, so we bought the REI Half Dome 2 Tent, which had a cool new pole system: It had lots of extra headroom which allowed both people in the tent to sit up at the same time! We sat inside the display model on the REI salesfloor and were already feeling happy. Vicki liked it that we each got our own door, so any late-night “issues” wouldn’t disturb the other sleeper. The only thing I didn’t like was that the tent itself was nearly all bug-proof mesh, and the tarp, while overhanging the tent nicely, had quite a gap underneath it near the ground. It looked to me as if it would have way too much ventilation; it would let in all the cold air and let out all our valuable heat. And if it were windy at all, it would be like we were camping outside. This would be great on a hot, sweaty summer night, but on a cool spring night at high elevation? We’d freeze our butts off! Just the same, we bought the tent. It was my birthday present, only five months late. As we walked out to the car I kept mentioning the ventilation issues to Vicki, about how our currently mismatched sleeping bags, while warm and goose-down filled, didn’t zip together, and with this new tent we’d have to sleep in separate bags, rather than together, in order to stay warm at night. This didn’t go over very well with Vicki. Or with me. If we were separate, we’d also be colder, being unable to harness the power of snuggle. It was a no-win situation. So we went back inside the store. To return the new tent? No no no! We decided to buy new sleeping bags instead! Yep, those old down bags were really losing their loft, and were barely worth carrying around anymore. Or so we told ourselves. But we certainly couldn’t afford new ultra-light down bags ($$$!). And down supposedly loses it’s effectiveness when wet (not that we’d ever gotten ours wet), so we would have to go with some new synthetic miracle insulation. Also, two identical sleeping bags will usually zip together into a double sleeping bag, which would be very cozy – no more drafts sneaking in near our feet in the night. So that was our plan. We looked at all of the expensive bags (everything is expensive at REI), and finally chose the “REI Siesta +30/40 Double” bag(s). It’s actually two matched mummy-style bags, made to zip together, one of which is thinner and rated to +40F while the other is thicker and rated to +30F. The idea is that you put the one on top that matches the current conditions, as the bottom bag does nothing for warmth when your body squashes it flat. I’d be carrying the thicker one, of course, but that was fine. Now, normally this model isn’t considered to be suitable for backpacking, as the bags are large and fluffy and don’t compress all that well, but in our case this wasn’t important as we both have external-frame backpacks; thus, the size of the rolled-up sleeping bag didn’t really matter when carried, strapped on the outside of the pack’s frame; they didn’t have to be stuffed deep inside like an internal-frame backpack. Besides, Vicki planned to make us some custom compression stuff-sacks for squeezing the bags smaller. No problem! 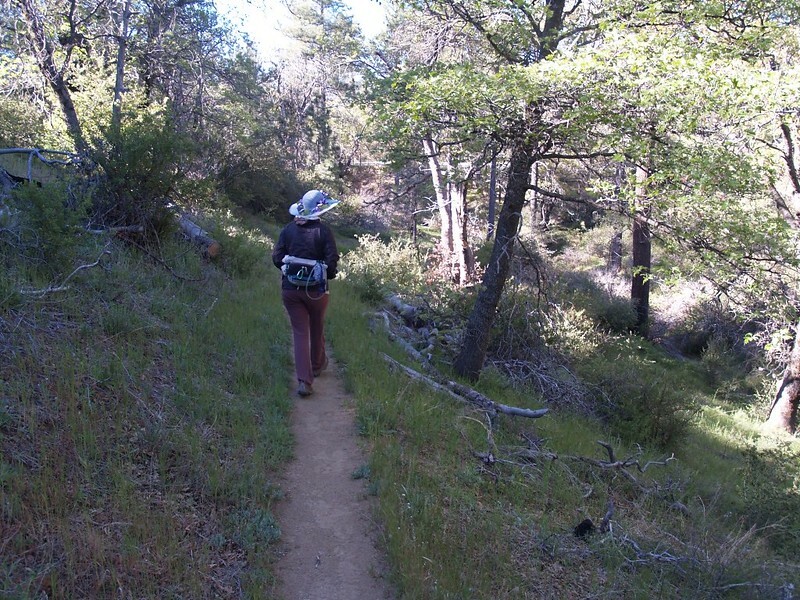 And the weight isn’t much of an issue with us, as I’m a much faster and stronger hiker than Vicki; adding five or even ten pounds to my pack wouldn’t change our overall hiking speed any. I might not like it, but it wouldn’t change anything material, except by giving me more exercise. My biggest concern with buying them was whether I should call these bags my next-year’s birthday present or not. But then I’d have nothing to look forward to. I ended up deciding that it was for two birthdays ago. Better late than never! We went home and set up the new tent in the living room. We inflated our thermarests and put our new sleeping bag(s) into the tent. We sat inside, then lay down, imagining that we were camping. We were thinking that the next weekend was Memorial Day, perfect for camping. A long weekend, but we had no camping reservations. Everyone and their brother would be out camping; it would be a zoo. Also, we had a party on Sunday afternoon. But we really wanted to go SOMEWHERE. With our new gear, of course. Well, Friday evening came and we decided to try for an overnight car-camp in the Laguna Mountain area. Maybe there’d be a campsite open for Friday night only. We grabbed our gear and threw it in the car. It was supposed to get down into the mid-thirties that night, and also be somewhat breezy; a perfect chance to test the qualities (or lack thereof) of our new sleeping system. We arrived on the mountain just before sunset. We cruised around Burnt Rancheria Campground, but everything was taken, or had a “reserved” tag on it. We saw a “Group Campground” sign with no groups present, but we weren’t a group, and had no reservation. We started driving further, toward Laguna Mountain Campground, but by then it was almost completely dark. I pulled over and we had a conference. Well, I’d always heard that you could hike/camp on the Pacific Crest Trail anytime without a permit, and as the PCT was just off the road, all we had to do was park, display our National Forest Parking Pass, and hike somewhere nearby, making sure we stayed at least 100 feet from the trail. So we did it. Stealth Camping. We attached the new tent and sleeping bags on our backpacks, put on our headlamps, and hiked into the darkness. In about fifteen minutes we found a decent spot for a tent. It wasn’t great, but it would be OK. And if we froze during the night we’d run back to the car and drive home. We set up the tent, and got ourselves snug in our new double sleeping bag. We read our books for a while, then went to sleep, and stayed nice and warm, utilizing the power of snuggle. When morning came we were still warm, even though it was cold outside. Success! We were very happy with our new gear. 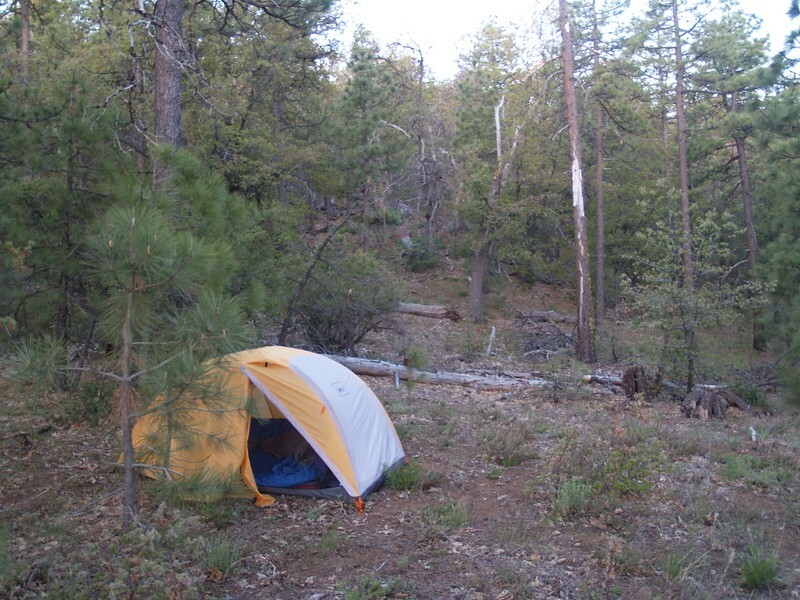 We didn’t stay in the tent for long, however, as I wasn’t really sure about the permit situation. 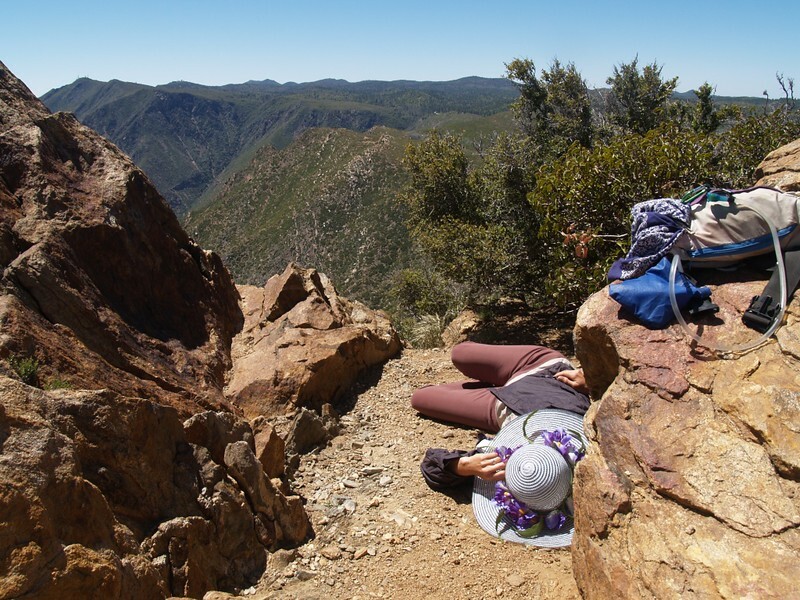 It would be better to pack up and truly Leave No Trace; we wouldn’t get caught that way! Vicki made breakfast while I packed up, and we made it back to the car well before eight AM. I figured that the rangers wouldn’t be out until after eight, so we’d be fine. 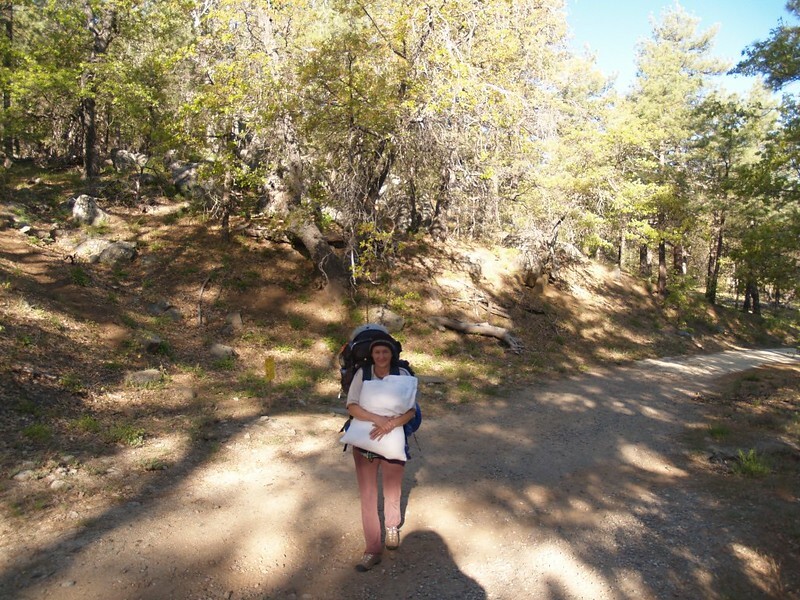 Vicki hiking back to the car in the morning, complete with a full-sized pillow. Luxury! And now for some actual fun in the mountains: Time to hike! 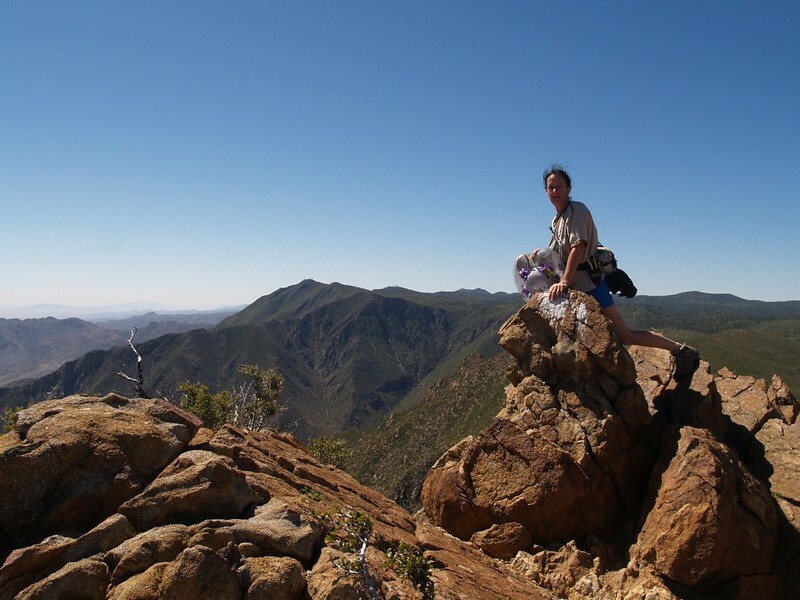 We had decided the night before that we would do an easy day-hike to Garnet Peak, about 3.5 miles each way, along the PCT, starting just north of the Laguna Mountain Campground. 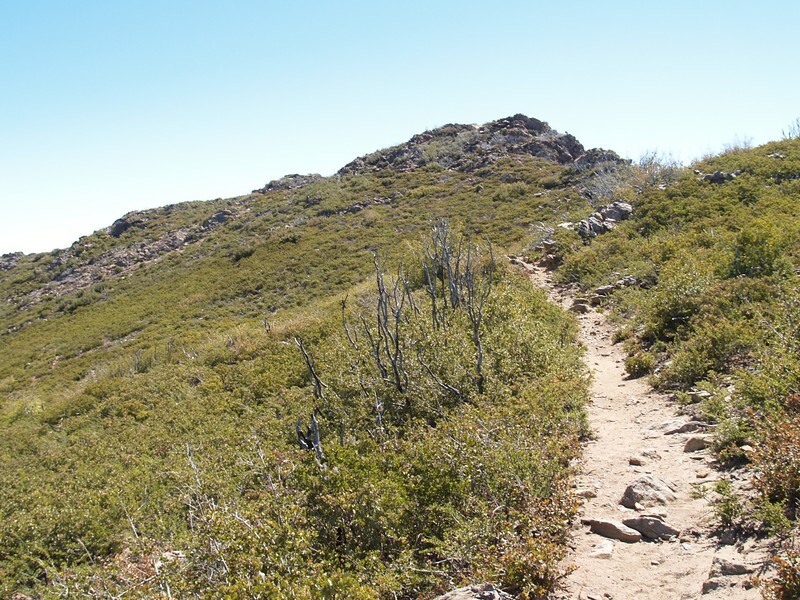 Garnet Peak is listed at about 5900 feet elevation, and we’d be starting near 5200, so this would be a cinch. 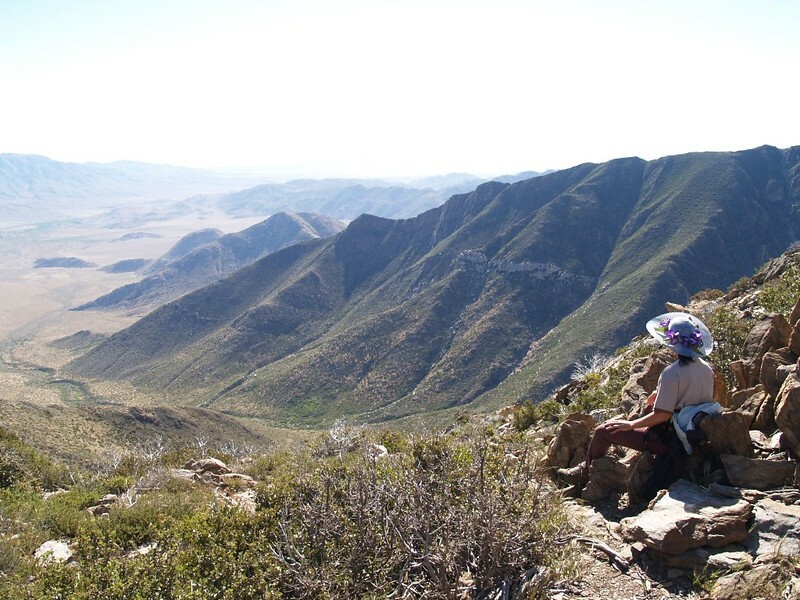 The PCT runs along the highest ridge of the Laguna Crest, parallel to County Road S1 (Sunrise Highway), so there are plenty of awesome views east into the Anza-Borrego Desert. 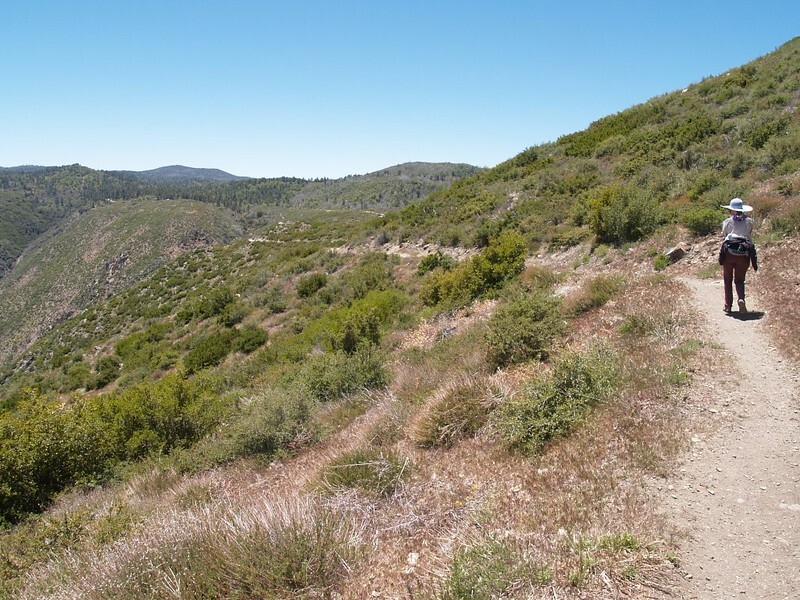 Highway S2, originally called the “Great Southern Overland Stage Route of 1849,” was down below us in the valley, and Whale Peak and the Fish Creek Mountains were further away. 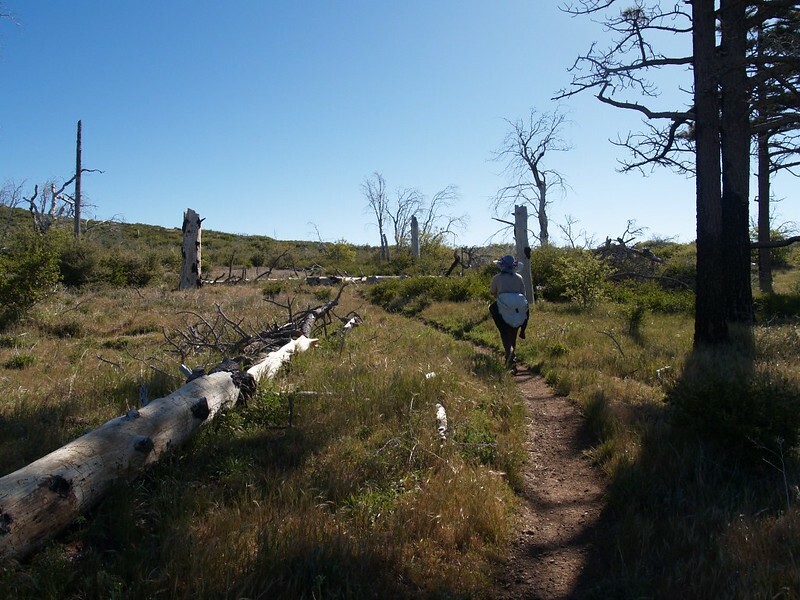 Parts of the trail along this stretch of the PCT had burned seven years ago, back in the 2003 Cedar Fire, but there were only some minor traces left from that day, as most of the vegetation along here was of the bushy chaparral variety, long since re-grown. The only place that still had some actual trees was down in a canyon near Penny Pines and Oasis Spring. It was nice to walk in the shade for a short while. 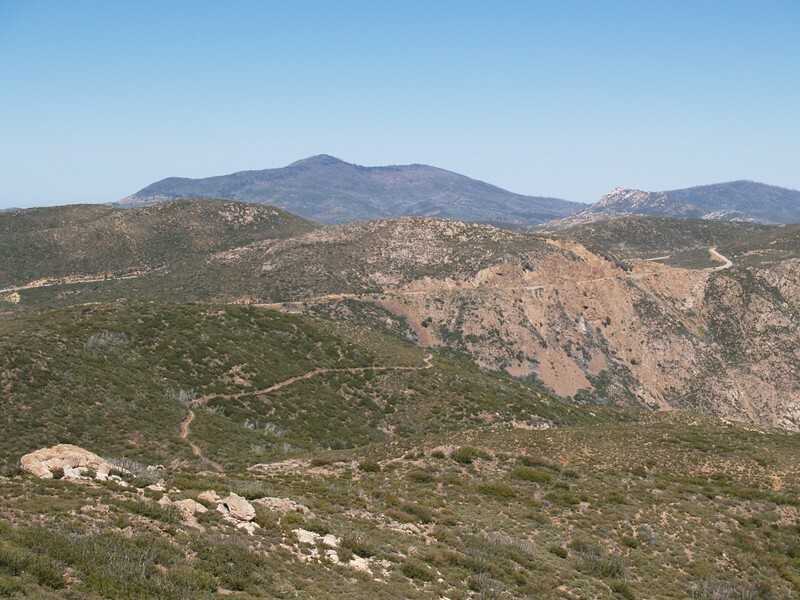 But then we were back in the sunny, dusty chaparral, heading for Garnet Peak. 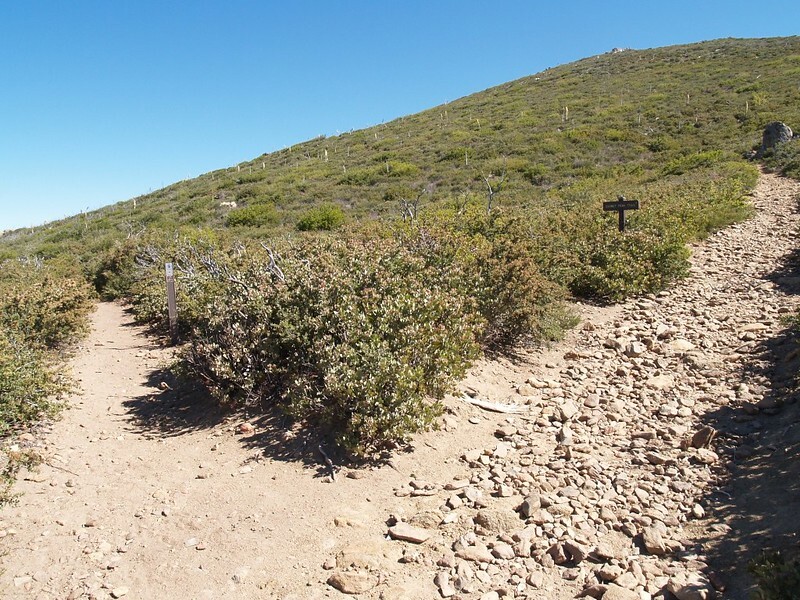 There is a very obvious sign for the trail to Garnet Peak on the PCT. This was the actual “exercise” portion of the hike; the rest of it was an easy, near-horizontal traverse. We trudged up to the top and had it all to ourselves for at least a half hour. We ate our lunch, and Vicki took her usual post-dinner nap. 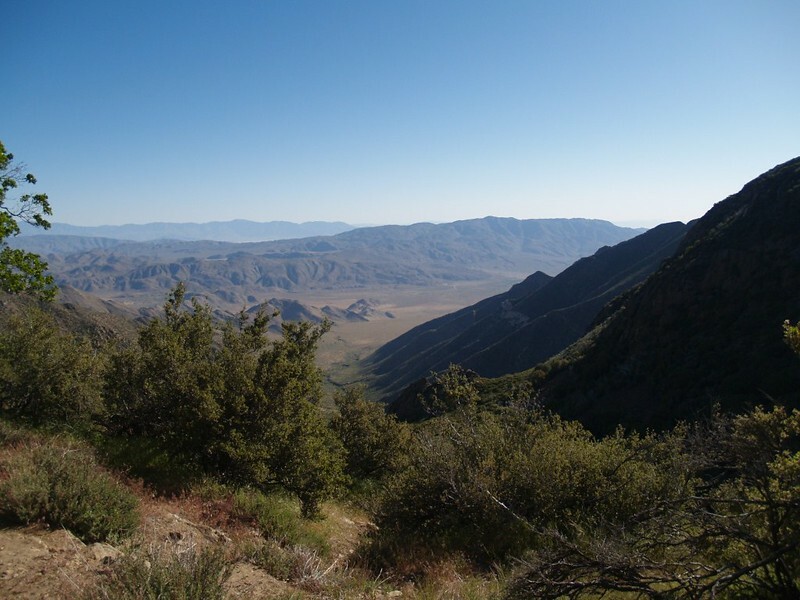 I took pictures and gazed around at the desert to the east, at Monument Peak to the Southeast, and at far-distant Mt. San Jacinto to the north. 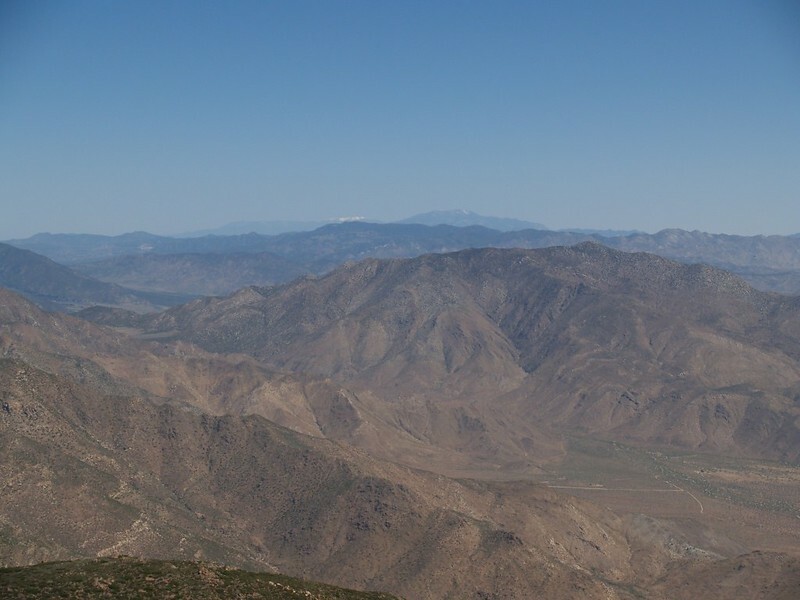 Beyond San Jacinto, amazingly enough, we were able to see the snow-capped summit of San Gorgonio, over ninety miles away. It was a very clear day, compared to the usual summertime haze. I sat down and read my book in the lee of a boulder. Another family with some kids showed up, but they were quiet and let Vicki sleep; they didn’t stay on the top for long. She woke up soon after, refreshed and ready to hike. On the way down the mountain, we met up with five local Firefighters. They were wearing their standard brightly-colored protective outfits, and were each carrying heavy gear, like flattened coils of hose, axes, radios, shovels, etc. They were on a training hike, staying in shape to be ready in case a forest fire broke out. We could see their truck off in the distance near the highway. For more photos ad videos see my Flickr Page.